Homdio V2 headset caught my eye as it looks sleek and more like a premium VR headset. The Homdio V2 headset has come a long way after a few updates on the old Homido headset. 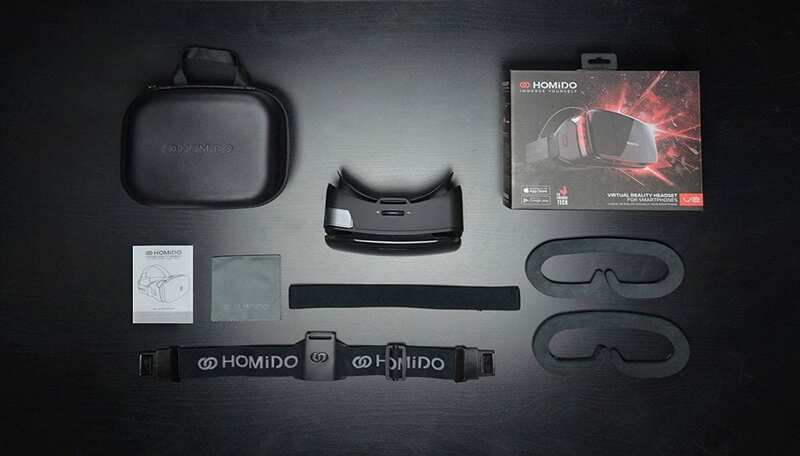 Well, Homido is one of the leading VR headset companies that is focusing on accommodating phone of different sizes in its VR headset and removes the exclusivity barrier that is seen with VR headsets like the Samsung Gear VR. Apparently, with time Daydream VR might be compatible with all android phones but that is a long way to go and till then we have Homido that has been making massive improvements in its VR headsets since the Homido VR Virtual reality headset is way better than the previous Homdio VR headset version. 1. In the previous VR headset, Homido had a pretty average build quality and it looked like a mediocre VR headset but the new Homdio V2 headset has got the premium look and slightly resembles the Gear VR. You can see a massive change in the design and the overall look of the headset is pretty amazing. 2. 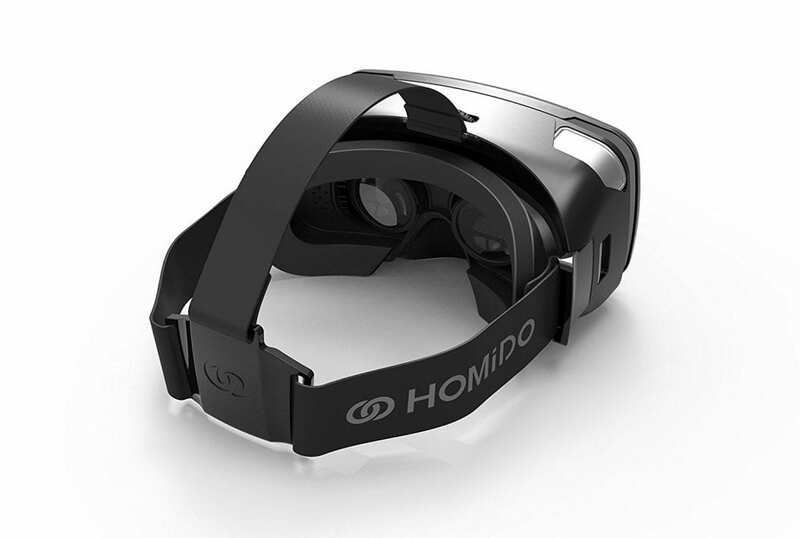 Homdio has built the VR headset keeping in mind that it goes well with phones of all screen sizes and hence they have made their lenses adjustable. You can move the lenses closer or farther away from the phone screen in order to have a better viewing experience. 3. 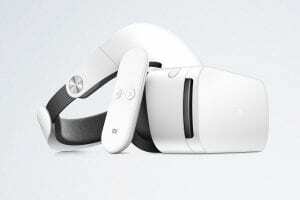 The headset also helps you set the interpupillary distance since different people have different interpupillary distances and once you adjust that it is more comfortable to use the VR headset. 4. The new Homdio VR headset has an action button on the top that would help you to select menu items and even for gaming or using the Google Cardboard apps. Homido has its own gaming controller which seems pretty dope. Although, I must admit I haven’t still tried it I have read some good reviews about it. So, if you too have tried it then do let me know your experience in the comment section below( I personally use a GameSir G3s gaming controller). 5. The face contact foam is interchangeable and it really blocks out all the light along with cradling the face in a nice manner. 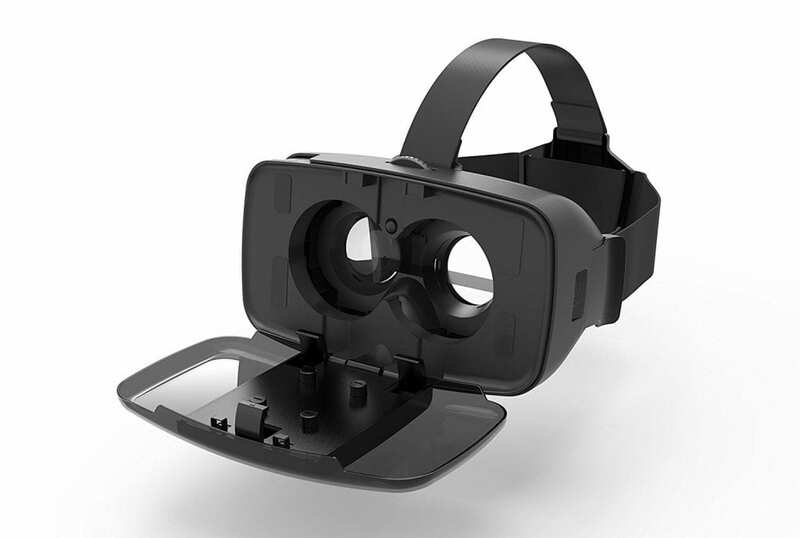 It is one of the best features of the VR headset and it helps you to have an immersive experience without having any unnecessary leakage of light from the corners of the VR headset. 6. You have a slight gap in the headset which helps you slide your charger through it hence making it easier for you to charge the phone while it is still inside the headset. It even helps you have enough space to push in your wired headphones although using a Bluetooth headphone might not create any such issues. 7. If you wear glasses then you may have to remove them while using the VR headset since it may create problems with most of the wide frame glasses. However, it really depends on your frame but in most of the cases, you might have to remove your glasses and instead adjust the VR headset lenses to accommodate your eyesight problems. 1. Many people have received the VR headset with a defective action button, well, I highly suggest that you pair a Bluetooth gaming controller with your phone if that is the case. Even a cheap Bluetooth controller would work pretty well or even better if you go through my best-recommended controllers. 2. There are a few people complaining about a few defective headsets on Amazon if you think that yours is defective then exchange the product for a new one since there can possibly be some manufacturing defects. However, this is a real inconvenience but apart from that, the headset is actually amazing if everything works right with your headset. The gaming content has only increased from the last time that we had reviewed the Homido VR headset. The official app for Homido has added more games and content which shows that the company is actually serious about growing their VR market and trying to make their apps more user-friendly. Apart from the games on the official app, there are plenty of other Android apps that you could try with this VR headset. The Google Cardboard app and games also add on to the list making the list of different types of content really long for this VR headset. The content seems to be ever growing for the smartphone-based VR headset since new VR apps and games release every day. So, content is no longer an issue with any VR headset as long as you have a Bluetooth controller to play all the games. From the Homido V2 Virtual Reality headset review, it is easy to conclude that this VR headset is way better than the previous Homido VR headset which was just another smartphone-based VR headset. It is way more comfortable and you could wear it for longer periods of time making it the best choice for gaming. 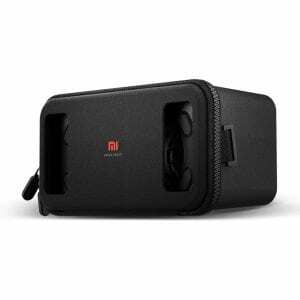 This VR headset is really comfortable and does offer an immersive experience for anyone that is looking for a VR headset in this range. Although you might find the Samsung Gear VR slightly cheaper, this VR headset is more compatible with phones of different companies and sizes making it a slightly better option. However, the limelight might be stolen from Homido V2 Virtual reality headset once Daydream VR headset comes out as being compatible with a majority of the Android phones. Is it worth the money? Not really. If the action button works well in your headset, then yes, otherwise you need to invest in a controller which are additional costs. For all readers in Europe, you could check out the official Homido website to buy the product. I would still find the Merge VR a slightly better option since it is cheaper and does leave you some money to buy off a controller. Check out the different colors in which the Merge VR is available. If you have any other questions let me know in the comment section below. great insight into Homido VR. Good to know that the company is making progress, but since there are so many VR headsets and (smart)phones coming out these days,I wonder if buying Homido V2 would be a good long-term decision? Will I still be able to use it once I change my phone? Also about the content – how does Homido’s selection compares to Samsung’s for example? Homido is really compatible with most of the phones so that should not be a problem, however, when compared to the Samsung Gear VR’s quality it does lack a bit but it is surely better than the useless cheap chinese VR headsets available in the market. I have one of the google cardboard headsets, which was nice to test out VR. Now i’m in the market for a VR headset that I can use for multi hour gaming sessions. It’s looking like this one may work out quite well for me. Thanks for the in depth review. I’m glad that you found this post helpful. Do let me know how you liked the VR headset once you have made a purchase. Glad I could help Tressy ! I love what you have done with this website. Well laid out, easy to read and navigate and really well designed. I also love what you have done with the sidebar menu. Virtual reality is the way of the future now, so it was interesting to read about this particular Homdio V2 product. Thanks for stopping by Wayne. With technology moving so quickly, it will be very interesting to see where VR is in a few years time with all types of VR, both smartphone and VR that connects to gaming consoles and PC’s such as Oculus Rift. Is there much content out there for such devices? As it is still relatively new (VR, that is) would be nice to know that the games and other immersive content is out there? Yes, there is actually plenty of content out there for such devices. Content was a problem before but not these days with new content coming up everyday. This VR headset really looks amazing. I am sad to say I have never owned one yet, but I want to buy one in the near future — so I might consider this one. Do you yourself own a VR headset? If so how do you like it? Is it fun playing games and doing other things on it? Yes, gaming on the VR headsets is fun, you need to try it, feels like a whole new world that you were missing out all this while! With more and more VR headsets model out there, this sure is a very interesting one. You have written a very good review and giving us the pros and cons of this particular VR model. And for someone like myself, who is curious about the features of Virtual headsets out there, you have given a great overview of this product! Thank you! Homido V2, is seriously an interesting product to try and since it already has a predecessor all we can hope from this one is improvement and amazing VR experiences. It is really nice to see such companies come out with improved versions of their VR headsets which proves that they are here to stay! Thanks for the great review. I am new to the VR world and was recently trying to learn more about it. If I were to use this for gaming for a long time, does it ever causes any discomfort and headaches after use? I was considering the Samsung Gear VR headset but given that I came across this review it seems like it may actually be a decent option to consider as well. Well, you can use it for 45 minutes straight without getting headaches and it is way better than the previous VR headset versions of the Homido. However, if you have a Gear VR compatible phone then I think the Gear VR would be a cheaper alternative compared to the Homido V2 VR headset. I have never tried a VR headset before so i cant exactly relate, but i have always been very interested in them ive never really gotten around to doing research to find that best brand and such but ill say this is a great place to start, Thank you with the informative Review ill be definitely looking into this. Homido V2 can be a starting point for many peopel since it is a pretty good VR headset. So, if you are a beginner and are viewing VR headsets for the first time then I must say that you have landed on the right product. Do check out the Homido V2 headset on Amazon! This Homido headset does look promising compared to its previous version. Have you or do you know of someone who has tried out this headset with an iPhone? I am an iPhone user but not Android so I’m just curious. Thanks. Also, looking forward to the release of DayDream VR and reading how you’d compare it with Homido version x by the time. I think it works just fine with an iPhones, I have read many iPhone users saying good things about this VR headset so I guess they did have a good VR experience. DayDream VR is another VR headset that is really interesting and I’m hoping to see more of it myself because it would apparently extend its phone compatibilty soon. For now it has limiteed Android Phone compatibitly but I’m looking forward to mroe from this VR headset. I like that Homido has more than one size because that does get rid of the exclusivity that you mentioned. The price is not bad too. I thought VR headsets would cost a lot more than that. One thing that does surprise me is the company knows there is an issue with the product and they have yet to fix it… But, at least they know they are wrong and are willing to replace the product without issue. You never know how true the complaint of the defective products on Amazon is and that is the reason I recommend buying from Homido’s official site. It is much better when you directly buy from the seller because there are higher chances of receiving a better quality product. This VR headset really looks comfortable and fun. I have never owned one, but I want to buy one in the near future. Being that I do not own one, I don’t really have an idea as to how it feels or works. Would it be a good investment (considering comfort and use). Also can this be used with a PS4? Homido VR is a smartphone VR headset and can only be used with smartphones. Just check the compatibility of these devices before buying any one of these VR headsets. You want to be sure that it works with your phone. VR headsets are a good investment and I personally find the Homido V2 a much better quality VR headset than most of the cheap chinese VR headsets available in the market. 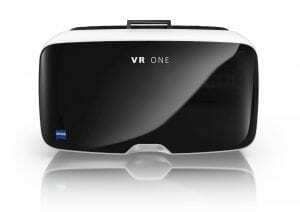 I am looking to get a VR headset for my son who is 12. He has been asking for one for a while and perhaps this one would be good. I do have a question. In the post you talk about android smartphones. Would this also work with an apple phone? He has an iPhone 7. Do you think this would be a good headset for him or would you recommend something else? Yes it would definetly work with an iPhone 7 and I think you should go for it. Your son would love this VR headset! I am completely new to this VR thing, even though I know it has been available on consoles and phones for some time now. I recently discovered that my half-year old android phone is quite capable of VR and I have been trying to get to know the different VR headsets that are on the market. Yeah, thanks for stopping by and letting us know what you think! I’m glad that my post could help yoiu make a better decision. Although I’m not totally against the new Homido V2 VR headset but I would definetly choose the Merge VR over it! If my opinions change tommorrow then I would surely mention an update on these posts, LOL. I am new to Virtual reality gear and just strting to look into getting a headset. Great to know about Homido and that it is one of the best brands. It is compatible with phones having screen sizes ranging between 4.5-6 inches. I guess I did forget to mention that in my above review. Thanks for asking this question as it might help others who would stumble upon this review. Make sure it has a gyroscope as well in order to be on the safer side since most of the newer models have it but you never know if your phone is the chosen one, LOL. These headsets are a bit of a mystery for me but I know my son wants one for his birthday so finding your site has come at a perfect time. I have read a couple more of your reviews and it looks like the Merge VR would be a good one for him to give this a try without breaking the bank. Are there any necessary accessories needed when using one of these headsets? You might just need a Bluetooth controller, that is all. There is no other specific accessories that you might need to get started with VR apart from the controller I mentioned above. This piece of equipment is going to be a part of our future for years to come; I can just see it. I haven’t had the chance to try VR reality out for myself, but I have heard so many positive reviews about it. Your post was great I am looking to purchase a VR headset soon, and now I have clarity on what exactly comes with buying a headset. Hey, Shrestha good review. I am glad that I read this review. First of all, I am not a gamer. I do have a younger nephew that is trying to get his mom to buy him on of these headsets. I like the fact that they are very versatile. He has an android phone so this is a plus for him. Now, will it adjust for him being though he is a pre-teen? I see you mention apps for this headset. Do you have to purchase the apps on do they come pre-loaded with a few gaming apps. What is the lifespan for these headsets? Can they be used for online gaming as well? Some of the apps are free and some you might need to pay for. The lifespan of these headsets really depends on the maintenance. There are specific games that you have for VR and these headsets are exclusive to those games. There are a few VR games where you have the multiplayer functionality. Hi, my wife and I are new to the VR industry. We have heard much about them, but have yet to own one or even test them out. Your article was very informative and you tackled pretty much everything to answer any questions. The article kept my attention. The color choice was great as well as choice of images. Glad you liked everything. If I do not include images, the content would just get plain boring for everyone to read. This VR headset is good but you should surely check out the Merge VR headset and Noon Plus VR headset as well. I like that you openly admit that you have yet to experience this specific model of VR headsets. Being a gamer myself looking over product reviews, this article is very specific to the benefits in the design, capabilities and durabilities of the product. I’m curious to know if the Homido is specifically for use with VR capable games or can it be used to take any phone experience to the VR level (like movies etc.)? I’m honest with my opinions and you can usually use VR headsets to watch 360 degree videos on YouTube and even movies. Although it would be more like sitting in a theater and watching them since you wont have the feature of interacting with the objects in VR. If you want to interact with the objects in VR then you should check out the PC VR headsets like the Oculus Rift and the HTC Vive. Ace! I just attended my first Comic Con, and they had a set up where people could try VR. I couldn’t believe the experience! It was one of the coolest things I’ve been able to do. So, here I am researching getting a pair of my own so that I can experience it more often! This is one of the best looking ones I’ve come across! I love the design too! 😀 Will defintley be investing in some of these… technology wins me over yet again! Haha, glad that you liked the VR headset. I personall like the design of htis VR headset as well. 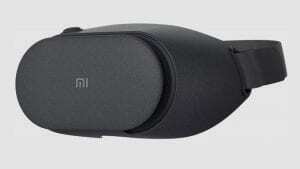 It is pretty comfortable and somehting you might do not want to let go off if you are into technology. Really Nice review of the Homido V2! It is also great to hear about the companies commitment to growth, and to product quality. I am a bit concerned with the idea that I have an older Galaxy Grand smart phone. The phone still works great and is in good shape, so my concerns is whether the Homido V2 would be compatible with such an older phone? Yes, it is compatible with this VR headset. You need to check the screen size and if it has a gyroscope and you are good to go. They have worked on the Homido V2 version and it looks much more promising than the previous Homido VR headset. Been looking into VR for a little while now and came across your review, seems like this is shaping up to be a good choice! Any recommendations of headphones or earphones which would be good with this or would any kind be fine for this? Im wondering whether you would choose this or is there a better option even if the price is a bit higher? You could use any headphones that go with your phone. I would choose this or the Merge VR since both of them are really good options when it comes to a VR headset. It is quite pricey compared to other VR headsets but definitely has more features than the cheaper ones. Even its look is very elegant. I’ve recently bought one on sale, a semi-VR but if I plan to upgrade, I’ll definitely look for this Homido one. Thanks for the feature review. You can even check out the Merge VR since it is relatively cheaper and does provide a premium quality VR experience. Other than that make sure about your phone compatibility before taking the final decision of purchasing a VR headset. A very good product review! Bravo. You told me what was good about Homido V2 specifically the ability to connect seamlessly with multiple android devices, a huge plus in comparison to Samsung. I like that your review identified problems with the device. This post was extremely helpful and informative. Thanks. Thanks. I’m hoping that I could anser most of your questions. Homido V2 overall is a good VR headset and it is one of the best that we have in the market right now. Virtual reality is so cool! As a child, I used to hear about the coming technology of virtual reality, and I always thought it seemed cool. I will definitely have to check out the virtual reality technology available. This headset “Homido” looks like a good one. I think I am going to look further into this vr. Glad that I could help. Do let us know if you have any other questions! The only thing I see with the Homido V2 that really stands out is the FOV 100 vs Daydream View’s 90. Trying Zeiss VR One Plus, Homido V2, Dream Vision Pro and Daydream View, Daydream beats all of them hands down. I have not tried Samsung Gear (which is said to be better than Daydream app-wise and FOV is 110?) Homido to me is basically like Zeiss & DreamVision… basically just Cardboard headsets and you really don’t get the full experience unless you have a Daydream controller.